Sandia's powerful 6-gallon compact and portable extractor combines the greatest attrbiutes from our carpet extractors, spotters, and upholstery cleaners to bring you one great machine. This portable 6-gallon unit is the professional way to quickly and thoroughly clean carpets, traffic lanes, spills, and upholstery. By attacking spots and traffic lanes early, the Sandia 6-gallon extractor helps you raise the level of appearance for your whole facility. Make this machine an important part of your cleaning routine today! *Please Note: We recommend running this machine on a 20 amp circuit, because of how powerful it is! These types of outlets can generally be found in a bathroom or kitchen. To make sure you're 100% ready to start cleaning when you receive your machine, we recommend taking a look at our carpet extraction procedures, for the latest hints and tips on the most efficient carpet cleaning methods. You should also make sure to stock up on carpet cleaning chemicals, to properly treat carpets, and carpet blowers to properly dry the carpet once they're clean. Stores and operates so easily that it's used more often. Powerful triple stage vacuum motor for efficient water recovery in a single corded unit. Rolls easily on four heavy-duty swivel castors. Lifetime on body, 2 years on motor and pump, 1 year on electrical. Customers who were interested in the Sandia Sniper Compact 6 Gallon Carpet Extractor - 100 PSI were also interested in the following items. 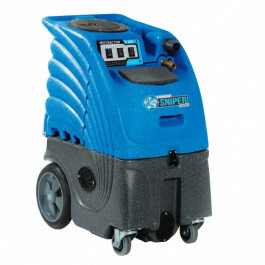 This is a review for the Sandia Sniper Compact 6 Gallon Carpet Extractor - 100 PSI.